Federal authorities have open investigations into radical Islamic terrorists in all 50 states, according to the Department of Homeland Security, which is warning that the threat of terrorism in the United States has reached an all time high with radicalized individuals in the country plotting to strike "each and every single day." The FBI has "open terrorist investigations in all 50 states," according to DHS Secretary John Kelly, who disclosed on Tuesday that there have been at least 37 "ISIS-linked plots to attack our country" since 2013, a number that shows no signs of diminishing. 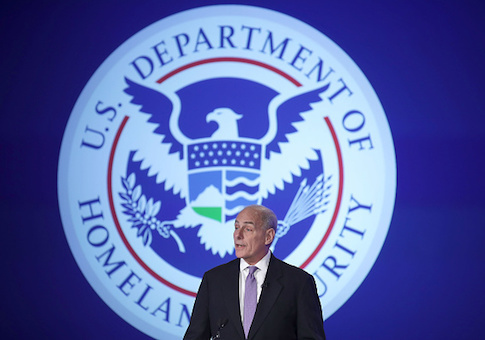 Kelly, in his first wide-ranging public address on the threat of terrorism in America since taking office, warned that America's borders remain wide-open and that there is evidence terror-linked individuals are exploiting these national security weaknesses and entering the United States. "We don’t know their intentions," Kelly said during an address at George Washington University. "We don’t know why they’re here or why they’re coming. We are completely blind to what they’re capable of." Terrorist also continues to sprout inside American communities across the country, according to Kelly, who said that in just the past year, there have been "36 homegrown terrorist cases in 18 states." "We’ve seen an unprecedented spike in homegrown terrorism," Kelly disclosed. "These are the cases we know about—homegrown terrorism is notoriously difficult to predict and control." Terrorists in the United States are plotting attacks "every single day," according to Kelly. "I tell you, without exaggeration, they try to carry out this mission each and every single day and no one can tell you how to stop it. No one," he said. The United States, he continued, is "under attack" from a wide variety of bad actors, including "failed states, cyber-terrorists, vicious smugglers, and sadistic radicals." "And we are under attack every single day," he said. "The threats are relentless." Those who slip over the border undetected, including criminals and potential radicalized terrorists, pose an unparalleled threat to the country. "We don’t get to vet them," Kelly said. "We don’t know their intentions. We don’t know they’re here. They slip into our country unnoticed, living among us, and we are completely blind as to what they are capable of." These threats just scrape the surface of the danger posed to America by terrorists inside and outside of the country, Kelly said. "This is all bad news, but it gets much worse," he explained. "Experts estimate that perhaps 10,000 citizens of Europe have joined the caliphate in Syria and Iraq. Thousands more are from nations in Asia, Africa and the Western Hemisphere. They have learned how to make IEDs, employ drones to drop ordnance, and acquired experience on the battlefield that by all reports they are bringing back home." These highly trained terrorist fighters are likely to return to their countries of origin and "wreak murderous havoc" across Europe, Asia, and the United States, among other countries. America lacks the ability to properly vet these individuals when they attempt to enter the country, according to Kelly, who warned that scores of radicalized individuals are trying each day to enter America. "Many are citizens of countries in our Visa Waiver Program, they can more easily travel to the United States which makes us a prime target for their exported violence," he said. The threat to America "has metastasized and decentralized, and the risk is as threatening today as it was that September morning almost 16 years ago," Kelly warned. "We are under attack from terrorists both within and outside of our borders," he said. "They are without conscience, and they operate without rules. They despise the United States, because we are a nation of rights, laws, and freedoms. They have a single mission, and that is our destruction."